These enchiladas are simple, affordable, and oh so satisfying. Eric was responsible for bringing a main dish to a work potluck, so I started going through our fridge and freezer trying to decide what I could make that wouldn’t require buying any ingredients. Cooking for a potluck can be tough when you’re on such a tight food budget. I discovered I had everything I needed to make enchiladas except for tomato sauce (to make the enchilada sauce that gets poured over the top). Rather than admit defeat, or buy enchilada sauce, I decided that these would be delicious with salsa on top as well. Guess what, I was right!Not only did Eric take these to work, but we’ve also had them six times in the last three weeks for lunch or dinner. Eric loves making them himself because they’re incredibly easy. He’s now added another dish to his list of meals he can make without my help and without a recipe. This is a great help to me because some nights I go from an eight hour work day, to teaching a cooking class, to writing a blog post, and don’t have the time or energy to make us dinner. We’ve made the enchiladas topped with salsa from a jar, and with homemade salsa verde, both are tasty. My salsa verde recipe is a little spicier than the salsas we’ve used so we prefer the salsa verde version, we like it hot! Going with salsa verde (or a homemade salsa) also lowers the price compared to using a store bought salsa. 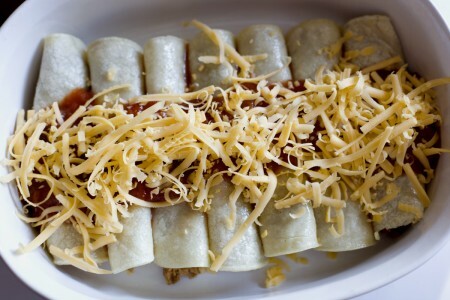 Enchiladas are basically a corn or flour tortilla wrapped around filling and covered in sauce. For our filling I used our new favorite pork recipe, the picante pork we made for Super Bowl appetizers. It’s got a complex flavor of spicy, salty and smoky, yet is ridiculously easy to make in the crockpot. One batch makes quite a bit of meat that we freeze in batches to use in tacos, taco salad, quesadillas, nachos and of course, enchiladas. 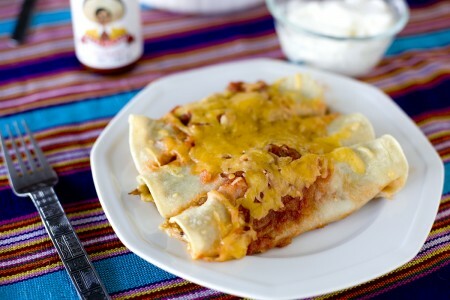 If you are really wanting to try enchiladas now and don’t want to wait to make picante pork, you have other options. You can simply cook up some ground beef, turkey or pork with taco seasoning for your meat. This is a fast substitute, but I highly recommend making the pulled pork when you have a chance, it’s so worth it! I made the recipe below for four servings. A really nice thing about these enchiladas is that they’re not exact. If making them at home for the two of us, I make five of them filled a little fuller (two for me and three for Eric). When we made them for the potluck, we made 25 and filled them with half the amount of beans, meat and cheese, knowing there would be plenty of food. If you’re trying to use up leftover beans or meat, this is a great way to stretch them as you can put smaller amounts in more tortillas. Stretching and repurposing your leftovers saves lots of money!!! Do you have a favorite way to use leftover food? Preheat oven to 350 degrees. Heat canola oil in a skillet on medium high until it shimmers. 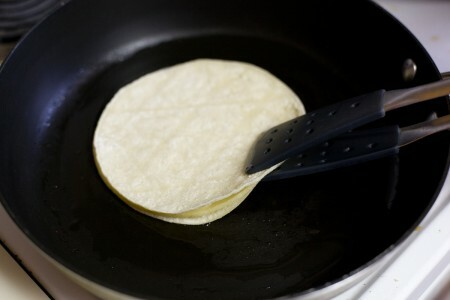 Place one tortilla in the skillet and let heat for 10 seconds. Place another tortilla on top of it and use tongs to flip both of them. Let heat another 10 seconds and add a third tortilla on top, use tongs to flip all three. Continue this process until all the tortillas are heated through, remove tortillas to a plate or paper towel. Spread each tortilla with a spoonful or two of refried beans. Top beans with picante pork. Reserve 1/2 cup of shredded cheddar, sprinkle the other 1/2 cup over the picante pork. Fold both sides over the filling and place seam side down in a baking dish. 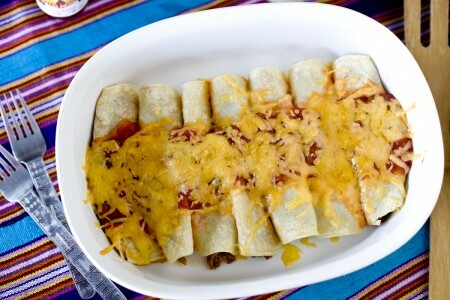 Pour salsa over the enchiladas and sprinkle with reserved cheddar cheese. Bake uncovered for 20 minutes until cheese is melted and bubbly. Serve with sour cream and tapatio sauce if desired. Approximate cost/serving: The cost of this whole dish was only $2, due to getting my pork on sale, buying beans from the dented can bin and getting my tortillas at a Latino market instead of the regular grocery store. So it came out to just 50 cents a serving. Gluten Free: My corn tortillas were totally gluten free, read the package to make sure you use gluten free ones as well. I love my leftover bolognese sauce for lasagna just over rice or pasta. Mmmm. Also – when on vacation – we grill every night. We have leftovers from every grilling, so I started to make an extra large batch of rice for one meal, save any leftover veggies too – then Saturday before we go home we have a big old wok-ful of fried rice. Great pictures! I especially love the one that shows the layers step by step. 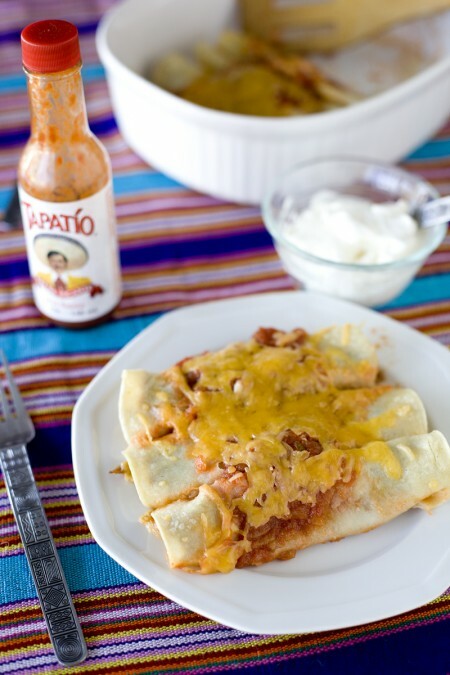 I LOVE enchiladas and will admit I don’t make them nearly enough considering I crave them all the time! We had enchiladas this week too! We roasted a turkey breast for Sunday dinner and used the leftover meat for sandwiches and enchiladas during the week. These look good, I’m going to have to make them now! 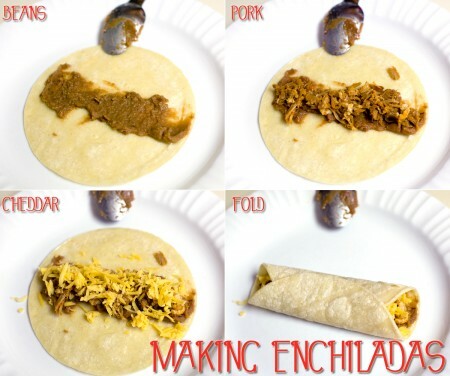 Your step by step photos that say “Making Enchiladas” what font did you use? It’s different, I like it. These look amazing! So easy. This is the perfect budget-friendly recipe.